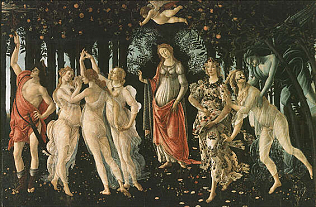 The Primavera – Spring was painted by Botticelli round 1482. No doubt this painting, together with the Birth of Venus, always by Botticelli, both displayed in the same room of the Uffizi Gallery, is one of the most appreciated and admired paintings of all time. The mythological subjects represented in this painting introduce us into a world where space and time no longer matter, harmony and perfection are there for us to be discovered.